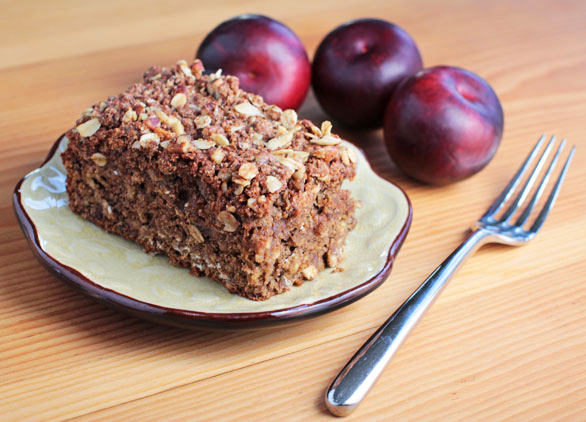 A wholesome accompaniment to your afternoon tea or coffee break, this treat melds the fall flavors of cinnamon and plums, and swirls them into a whole-grain-and-oat-based snack that’s just a tad sweet, but absolutely delicious. Another attribute to its credit: this cake is oil free. All the richness comes from cashews and coconut milk blended into the batter. The crumble topping sweetens the deal, while the baked-in plums add little surprise bursts of goodness throughout. 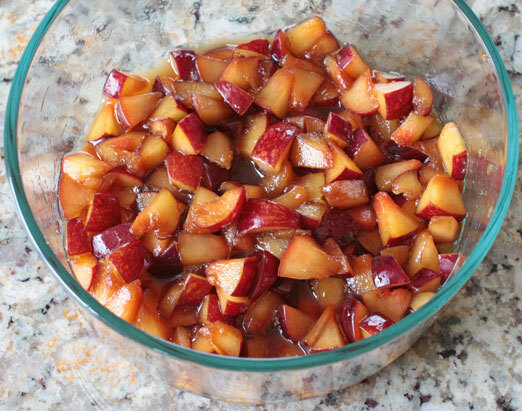 The recipe below calls for a make-in-advance procedure: macerating the chopped plums and then simmering them into a basic jam. This extra step of making jam is not obligatory. I’ve also made this cake simply by folding raw, chopped plums into the batter just before spreading it out into the prepared pan, and it was still wonderful. 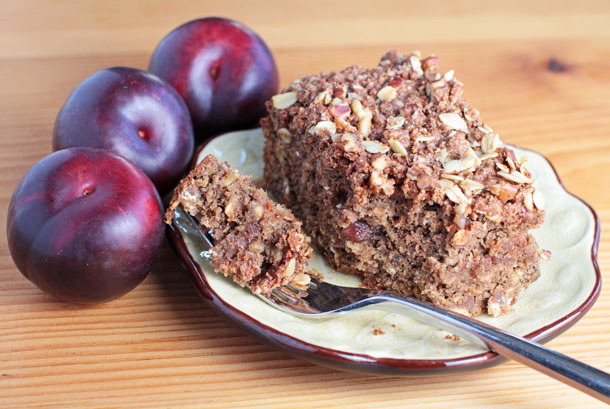 I take these additional measures because it concentrates the flavors of the plums and gives them a syrupy-sweet consistency that is extra delicious when stirred into the cake. Plus, if the plums aren’t at the peak of ripeness, the added sugar helps out. The choice is yours, of course, depending on your time and motivation. It doesn’t take terribly long; it just requires a little advance planning. 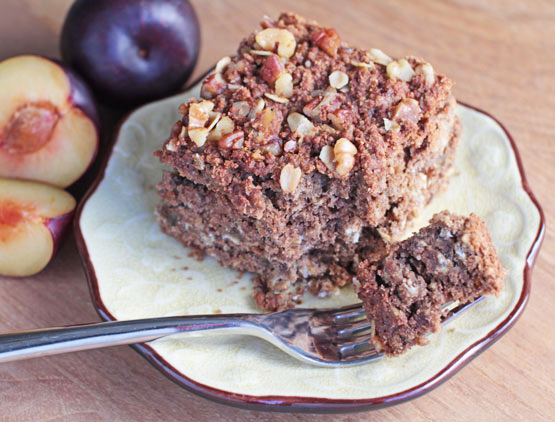 One more note: This cake is equally delicious if you stir in chopped apples instead of plums. No additional preparation is necessary in that case. 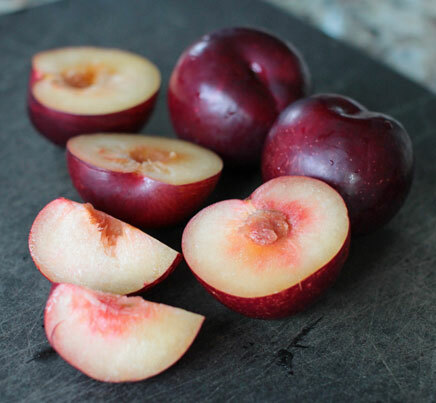 If you’re making the jam for the cake, at least a few hours before you want to bake it, chop 4 plums into small pieces (you can leave the skin on). If you’re skipping this step, you can just chop 2-3 plums into a small dice (roughly 1 cup) and jump ahead to make the topping. 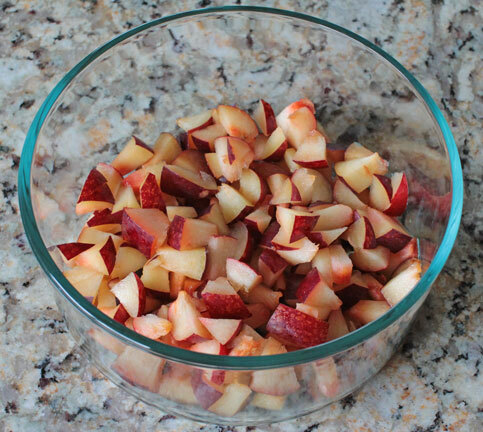 In a small bowl, mix the diced plums with 2 tsp. lemon (or lime) juice and 2 T. maple syrup. Leave the mixture on your kitchen counter and, every one in a while, stir the fruit with the juice. The plums will begin to break down and macerate a little, taking on a bit of a syrup-like consistency. 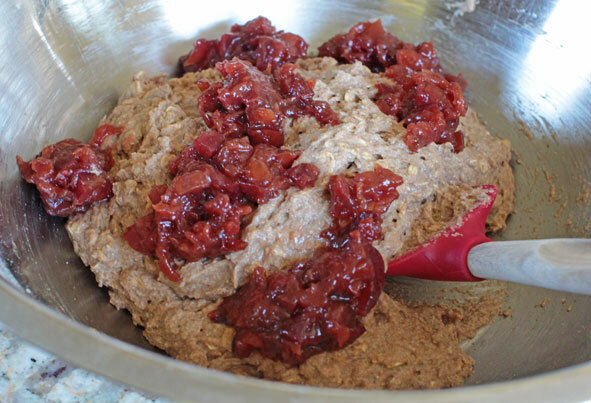 You can let the mixture sit for at least a few hours, or even overnight in the fridge. 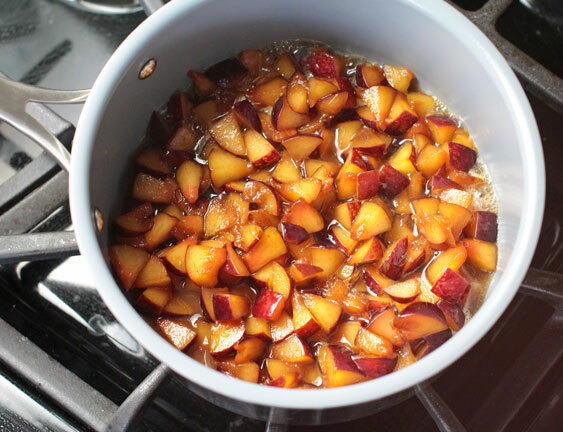 Once you’ve macerated the plums, transfer them to a small saucepan with all the juice in the bowl, and sprinkle on 1 T. coconut palm sugar (or sucanat, also known as unrefined whole cane sugar). Simmer for about 10-15 minutes, stirring occasionally. Once the plums are soft, you can even mash them a bit with a fork to extract more of the juice and help break them down some more. When you’ve finished simmering the plums, they should have a jam-like consistency. You can store your rudimentary jam in an airtight container in the fridge if you’re not baking your cake right away, or you can move on to begin baking. First, we’ll assemble the “crumble” topping. 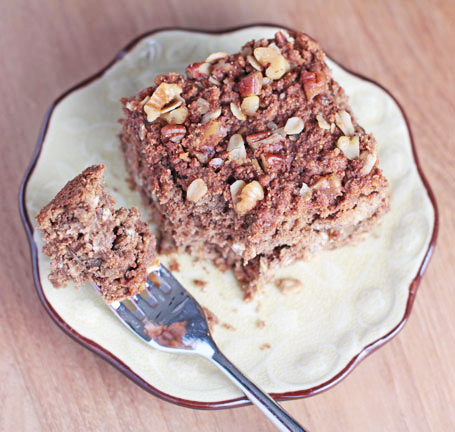 In a small bowl, combine 2 T. of oat flour or almond flour, 1 T. of coconut palm sugar (or other unrefined sugar), 1 tsp. of ground cinnamon and 1 T. of coconut milk (coconut oil is another option if you don’t object to using oil). With two forks, mash the coconut milk or oil into the rest of the ingredients, until the consistency becomes sort of like wet sand. 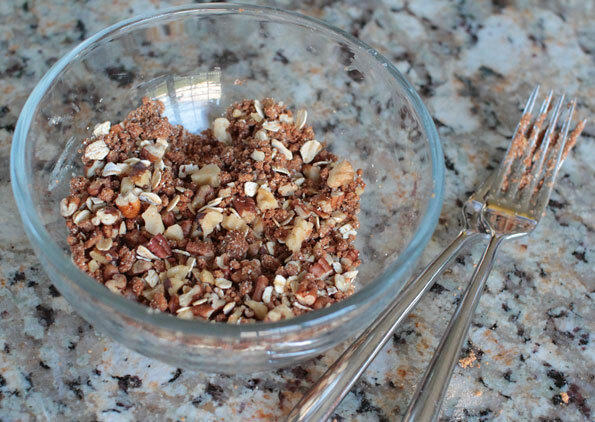 Once the ingredients are uniformly combined, stir in the ¼ cup of chopped nuts and 1 T. of rolled oats. Set aside. Preheat the oven to 350° F and grease an 8-inch square baking pan. Now let’s prepare the cake batter. In a blender, combine ½ cup of apple cider, 1 plum (remove the pit first, but you can leave on the skin), ½ cup of raw cashews, 3 T. coconut milk, ¼ maple syrup, ¼ cup of “aquafaba” (the cooking water from chickpeas or the liquid in canned chickpeas), 1 T. ground flax or chia seed, 1 tsp. vanilla extract and 1 tsp. lime juice. Blend until smooth. 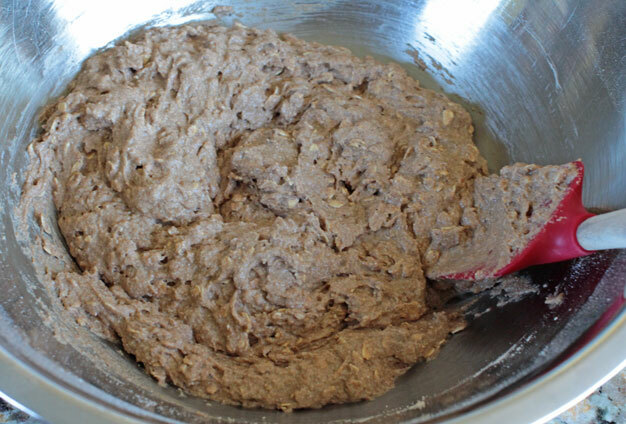 In a large bowl, combine the dry ingredients: 1 cup of rolled oats, 1 cup of sprouted whole wheat flour, ½ cup of barley flour (or spelt flour), 2 tsp. of baking powder, 1 tsp of baking soda, 2 tsp. of ground cinnamon and ½ tsp. fine sea salt. Stir to combine thoroughly. Make a well in the center of the dry ingredients, and then pour in the contents of the blender. Stir until the ingredients are uniformly combined, but try not to over-stir. 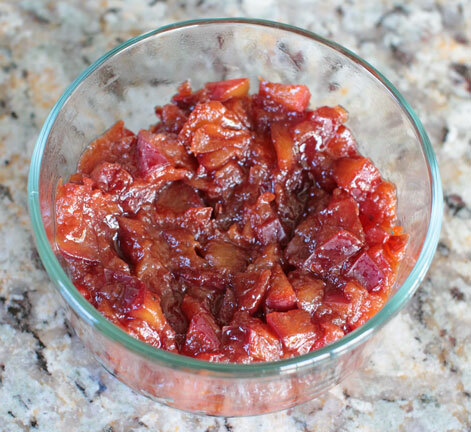 Fold in the prepared plum jam, or if you skipped the jam-making step, fold in about 1 cup of raw plums, chopped into a small dice. Transfer the cake batter to the prepared 8-inch baking pan. Using a silicone spatula, try to spread the batter out as evenly as possible, to ensure even baking. 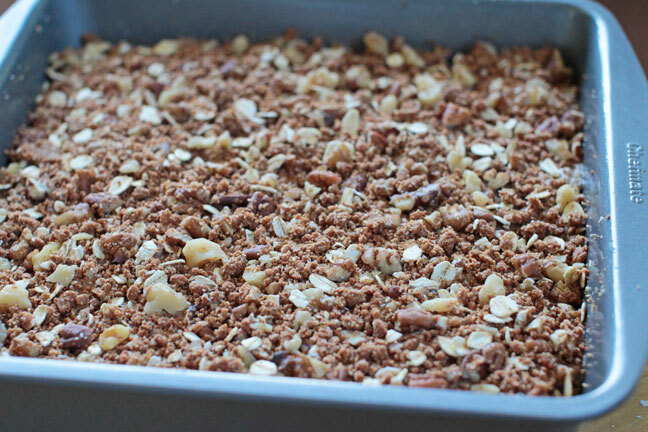 Grab your bowl of crumble topping, and sprinkle it over the top of the cake. Bake for 40 minutes, or until a toothpick comes out clean when inserted in the middle. Remove from the oven and allow to cool for at least a half hour before cutting and serving. 2 Responses to "Cinnamon Plum Coffee Cake"
I just can’t bring myself to use “aquafaba”. Years of diligently rinsing my cooked beans has me programmed to think of the water as trash–and also I fear the farts! Isn’t the bean water hard on vata-type digestive systems? But–I will try the recipe without it! Thank you! The photos are quite enticing. Hi Marissa! 🙂 Maybe it depends on a person’s specific body type and digestive system? I’ve used chickpea water in my chana masala dish for years without knowing its egg-replacing benefits (without the undesirable digestive side effects, as far as I’ve noticed) and I think it’s often used in homemade hummus. Gili the Israeli yoga teacher adds it to his hummus recipe and he told me to freeze the leftover “aquafaba” (although he didn’t call it that) and add it to soups because of its nutritional value (but that’s just hearsay, I have no idea what the nutritional value actually is – I think there’s a Fund Me campaign to have one done, haha). Anyway, if you don’t want to use it in this cake, I’ve made it plenty of times without the aquafaba, and it was great. I think it helps give it a little more binding structure, but it’s not necessary. Maybe replace that quantity of liquid with extra coconut milk or some almond milk instead, or coconut oil if you’d like. Hope you like it!